Spring break for most college students is a picture of warm weather, beaches, sunburns, and excessive hangovers. For an adventure addict like myself, nothing about the above sounds like an ideal spring break. Instead of looking forward to a trip with friends full of relaxation and parties, I was looking forward to a backpacking trip with ample suffering and rewarding views. That is how I decided to hike the Black Mountain Crest Trail. I first came across the Black Mountain Crest a few years back with a simple Google search- “toughest hikes in America.” Seems like an odd Google search, but tough trails are where my bucket list starts. 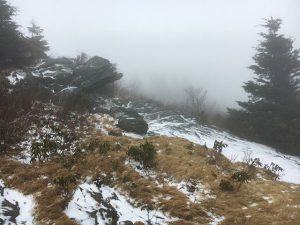 Everything I read about the Black Mountain Crest Trail in North Carolina deemed it one of the most rugged, difficult trails in the Eastern US. At only 12 miles long, its short length shouldn’t be overlooked as it packs in plenty of elevation gain, technical hiking, and difficulty along those few miles. The ridge-line traverse covers five of the ten highest peaks East of the Mississippi River, eight different six-thousand foot peaks, and a finish on Mt. 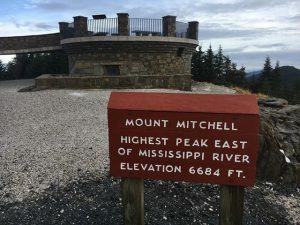 Mitchell, the highest mountain in the eastern US. As I planned my spring break trip on the BMCT, I grew excited about finally getting to attempt this well renowned trail. I amped up my training, doing stair repeats with a pack on several times a week. A week and a half before the trip, my hiking partner bailed on me, so I decided to embark on the trip alone. As most of us that have been stuck inside all winter with cabin fever would, I grossly overestimated my own fitness. 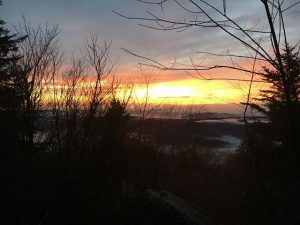 I hastily dismissed any warnings I read about the difficulty of the trail and, with a false sense of my own ability, believed I could knock off the trail fairly easily. The trail runs end to end, so I planned on traversing the trail twice- once to complete it, the second to hike back to my car. Ignoring the fact that online forums advised against attempting the trail in one day, I would hike the trail twice in two days. The only campsite on the trail sits 8 miles in at Deep Gap, so I started with the intention of hiking 8 miles on my first day and 16 the second to finish up my first traverse as well as the entirety of the second. The Black Mountain Crest Trail begins with a 4 mile long climb, from just over 2,000 feet in elevation up to above 6,000. It is a steep ascent that drags on, up switchback after switchback. 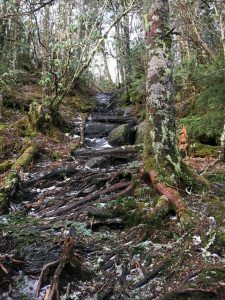 The climb begins along a roaring creek, which still had icicles hanging from waterfalls. As the climb steepens, it breaks away from the creek and continues deeper into Pisgah National Forest. Slowly, as you gain elevation, the forest changes from the hardwoods that make up the valleys to a thick evergreen forest abundant in Balsam Firs. 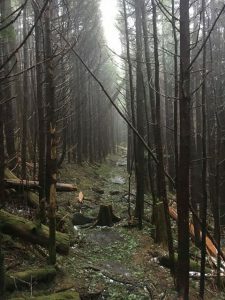 As I gained elevation, the buds that were just starting to form on trees near the start gave way to a thin layer of snow and a thick fog that blanketed the eerie forest around me. After two hours of effort, I broke out into a small clearing on Celo Knob. Despite temperatures below 40 degrees, I was in short sleeves and soaked in sweat from the climb. In the exposed clearing, out of the protection of the pines, a cool wind blew water vapor onto my hat, beard and pack, settling on my skin and chilling me. I kept hiking to stay warm, enjoying a short stretch of relatively easy terrain highlighted by grassy trails and frequent clearings, where the clouds ensured I could not enjoy the view. The final few miles to Deep Gap were a series of technical ups and downs along the ridge-line, passing by unique rock formations and massive, moss covered boulders, culminating in the summit of Mount Winter Star. A rocky and steep descent to Deep Gap followed this peak, where I arrived to find a small, grassy clearing and warning signs of recent bear activity posted on several trees. I set up my tent at Deep Gap in the early afternoon as a light rain started to fall, which progressed to a steady downpour as the evening wore on. Deep Gap is the only water source on the BMCT, a small spring just a short walk from my tent. The recent cold snap had left the spring frozen solid, an inch of ice coating the trail where the spring should’ve been. That left me to fill my water bottles from a steady drip of melt-water from icicles, a time consuming but necessary process. I was in my tent by 6 PM, dinner finished and bear bag hung, as the pouring rain pushed me into an early bedtime. When my alarm went off at 6 AM, I was shocked to wake up to near complete silence. No rain drumming on the tent, no wind whipping through the trees, the break from the weather and change from the forecast was a pleasant surprise. I crawled out of my tent into darkness, before even the birds began singing. I took down my tent and packed up by the light of my headlamp, pausing repeatedly to watch a spectacular sunrise. The clouds had settled down into the valley overnight, leaving the peaks as islands in a sea of clouds as the darkness faded and the radiant orange light slowly reached the forest around me. I started my hike out of Deep Gap with what I had read was a “crusher of a climb” up Potato Hill. This was no understatement, and I reached the top with pounding heart, throbbing legs, and heaving chest. I then continued along the ridge-line for several more miles, gaining elevation as I hiked across a series of peaks. The next few miles were fairly technical hiking, and in some spots the going was a bit treacherous in wet and icy conditions. In more than one spot, the climbs were steep enough that ropes and rebar had been fixed to trees and rocks to make the climb possible. 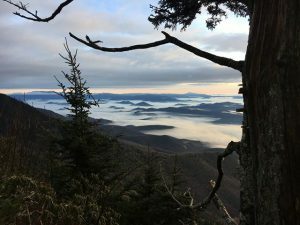 I made my way over Cattail Peak, Balsam Cone, Big Tom, Mount Craig, and finally Mt. Mitchell. The trail concluded on the summit of 6,683 foot Mt. Mitchell, the highest peak East of the Mississippi. I celebrated finishing the trail atop the observation tower, alone, the parking lot at the summit was completely empty. I reached the summit just before 9 AM, four miles into my day, and celebrated completing the famed Black Mountain Crest Trail. Despite cold temperatures, I stood on the summit in a peaceful, exhilarating moment in short sleeves, soaked in sweat from a difficult 4 miles. I let out a wild howl from the peak to celebrate the summit and spent a few minutes standing in awe and reverence at this spectacular peak, looking back on the rows of peaks I had just traversed. I had finished the trail, but I was still 12 miles from my car, so I let the momentary jubilation slip away and motivated myself to hike the trail again, this time in the opposite direction. The four miles back to Deep Gap flowed quickly, the technical hiking tiring me out despite a net elevation loss. By the time I arrived at the previous night’s camp at Deep Gap, 8 miles into my day, I was pretty exhausted. I contemplated stopping here, but it wasn’t yet 11 AM and I knew after a lunch break I would have enough energy to complete the remaining 8 miles. After lunch at Deep Gap, the 4 miles back to Celo Knob dragged on. The peaks passed slowly as I grew tired, stopping frequently to rest my legs, catch my breath, and enjoy the exquisite views on both sides of the ridge. The views, hidden by clouds the day before, were now able to be enjoyed on a sunny day, in perfect hiking weather. Finally I reached Celo Knob, and from there it was a steep, knee jarring 4 mile descent back to the trailhead. I cruised through the descent as quickly as I could, arriving back at the trailhead around 2 PM with quaking legs and sore knees. At the conclusion of my hike, I had come away with a lot of lessons. The trail was every bit as difficult as I had read, and I had grossly overestimated my own fitness and underestimated the difficulty of the trail. I had completed the Black Mountain Crest Trail twice in two days, alone. It was a great experience for my first solo backpacking trip in over two years, something I thoroughly enjoyed. Despite the difficulty, the trail was extraordinarily beautiful and one of the coolest trails I’ve ever hiked on. I’d strongly recommend checking it out sometime if you enjoy, as I do, intense suffering with great rewards. If you do, train for it and don’t expect it to be easy. It’s one of the most challenging trails you can find and packs a lot into those 12 short miles. I’d advise against attempting it in one day, take it slow. If this trail is on your list, I wouldn’t encourage hiking a 16 mile day; that was one of the mistakes I made on my hike. Don’t expect to find me back on the BMCT anytime soon, I need a long while to get over the misery before I’m ready to once again subject myself to that torture. But I leave having checked a trail off my bucket list and satisfied with a spring break spent just the way I like it. 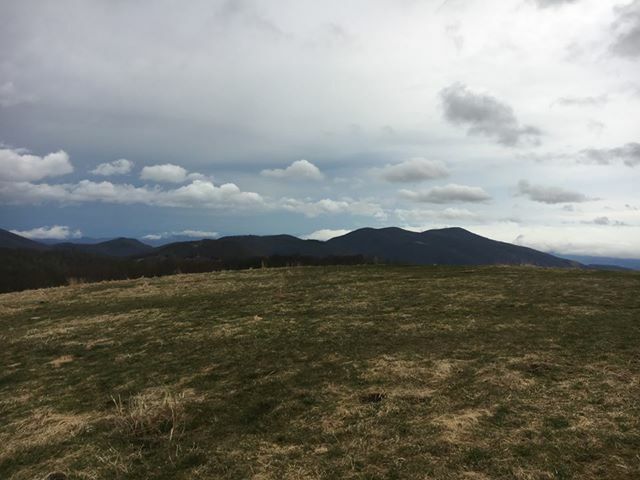 Finishing the trail in the early afternoon left me with time to kill, so I drove 90 minutes to Max Patch Mountain in North Carolina. 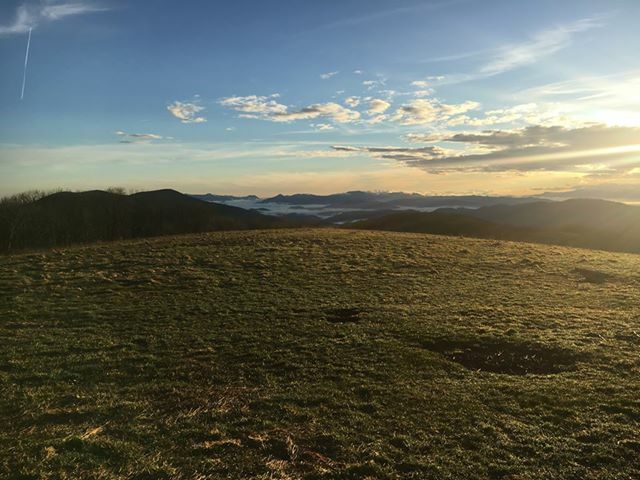 Max Patch is an amazing grassy bald along the Appalachian Trail offering panoramic views. A gravel road takes hikers within a half mile of the summit. I was not ashamed to drive to the top instead of hiking it, having already done my share of hiking for the day. 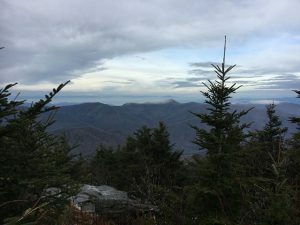 I spent 2 hours that evening on the summit, relishing in 40 mph winds and incredible views, watching a storm roll in from the nearby Smoky Mountains as darkness settled. I spent that night in my car just below the Max Patch summit, waking up just as the storm abated. I had another 4 hours on the summit, mostly to myself, to simply sit and enjoy one of my favorite mountaintops before starting the drive to Greensboro, NC and then back home to Cincinnati. This was a storybook ending to a great backpacking trip, watching the sun rise over the Blue Ridge Mountains and reflecting on a few days in the mountains that I call home.